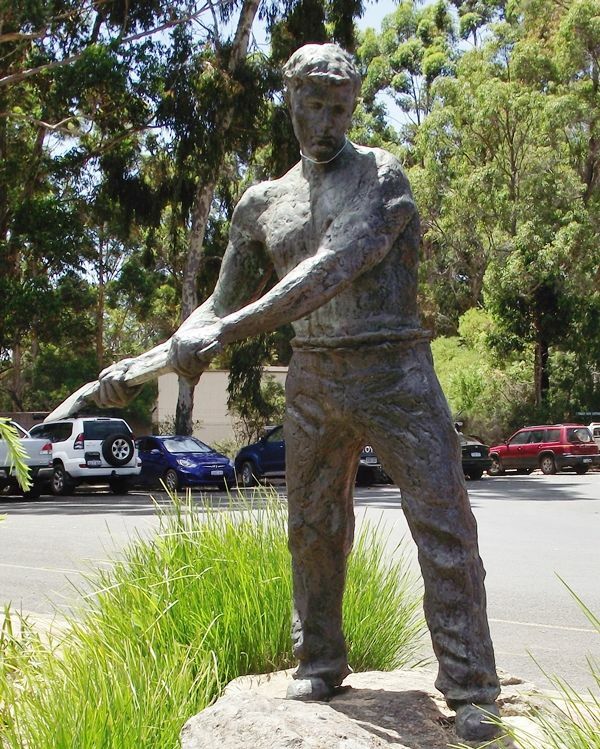 A bronze statue of a bare chested woodcutter ready to swing his axe is a tribute to the pioneers of the timber industry in the Warren District. Timber felling had begun in the last decades of the 19th Century, although due to a lack of transport, large-scale exploitation of the Districts forest resources did not occur until the 1910s. The requirement for hardwood timber sleepers for the Trans-Australia Railway from Kalgoorlie to Port Augusta led to the opening up of the karri and jarrah forests in the District. In 1911, the Wilgarup Karri and Jarrah Co mill was opened near Jardanup (now Jardee) and State Saw Mill No.1 established in Deanmill. 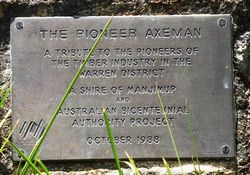 The need to ship the cut timber from the area led to the extension of the Western Australian Government Railways (WAGR) line from Bridgetown to Jardanup (Jardee) in 1911. This was later extended to State Saw Mills 2 and 3 at Big Brook (now Pemberton) in 1914. Other mills and their supporting mill towns followed over the next four decades at Northcliffe, Shannon, Quinninup, Nyamup, Tone River and Palgarup. 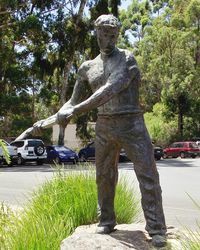 Manjimup became a base of operations for Bunnings Bros, which continues to this day, under the ownership of Auswest Timbers.